The incoming class of Wesley College filled the auditorium at the Schwartz Center for the Arts on August 23, 2008. The center was the site of the Opening Convocation, the official beginning of the academic year. “This is always an extremely exciting time in the life of any college campus, but especially for Wesley and for me as I begin my presidency here,” said Dr. William Johnston, the College’s sixteenth president. The incoming class of 562 new students arrives at Wesley from a diversified background. Approximately 75% of the these students come from Delaware, New Jersey and Maryland, while others come from Washington, D.C., Arizona, Connecticut, Florida, Massachusetts, North Carolina, New York, Pennsylvania, Virginia, Nigeria and the United Kingdom. 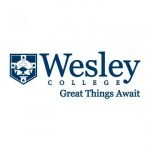 Over half of the new students have declared a major in one of Wesley’s 20 academic programs. Two students have achieved the Presidential Student Community Service Award, one student escaped Kosovo in the 1990s to come to the United States to start a new life with their family, and one student even tried out for American Idol. “Wesley is proud of our incoming class of students, and we look forward to their continued success,” said Bill Firman, Dean of Enrollment Management. The 562 students participated in a variety of on-campus activities to welcome them to the campus. Mary Alice Ozechoski, Dean of Students stated, “the variety of activities to begin this academic year showcased a renewed commitment for Wesley College to increase opportunities for student engagement on campus.” Events included a presentation by Mr. Jonathan Sprinkles, a nationally acclaimed speaker, novelties and games in the DuPont College Center, and the Academic Convocation followed by a campus wide picnic for the entire Wesley family. “This is a phenomenal time to be at Wesley. I am very proud of our talented students and committed faculty,” President Johnston said. Overall enrollment, including graduate and undergraduate, tops 1700 students for the fourth consecutive year.